When it comes to managing money, a lot of Americans feel like they’re on the right track. More than half of U.S. adults, according to a recent Student Loan Hero survey of over 1,000 adults, mostly between the ages of 25 and 44, say they’re confident about meeting their financial goals. And nearly all American men in the survey say they’re confident about handling their finances overall. When it comes to taking out loans, planning for retirement, managing investments and negotiating their salaries, most men feel like they’re up to the task. Women, though, are less sure. When it comes to how Americans feel about money, says Student Loan Hero, “there’s a clear gender gap.” About two-thirds of men feel comfortable negotiating their salary versus only half of women. 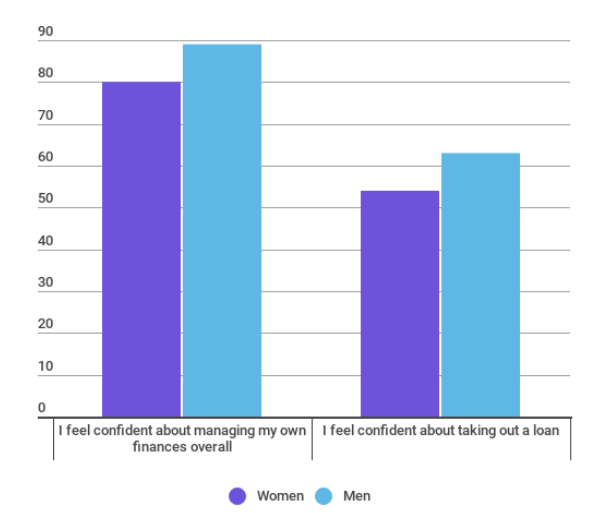 Over 60 percent of men say they’re confident investing versus only about 45 percent of women, and 63 percent of men say they’re comfortable taking out a loan versus 54 percent of women. 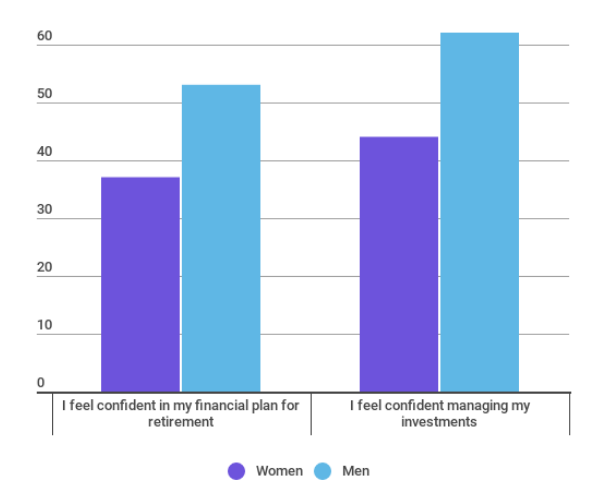 There’s a gap when it comes to confidence about the future, too: 53 percent of men are feel good about retirement versus only 37 percent of women. Overall, nearly 90 percent of men feel good about how well they manage money. Women trail by about 10 percentage points. Meanwhile, 42 percent of women have less than $500 in savings as compared to a third of men; 55 percent of men have more than $1,000 versus 47 percent of women; and, of course, men still earn more than their female peers. Overall, though, Americans are financially confident. Student Loan Hero finds that 83 percent of respondents feel good about managing their money generally, and 88 percent are confident about balancing their checkbooks and paying bills on time. Not everyone is optimistic, though. Over half of respondents don’t consider themselves a “financial success,” Student Loan Hero reports, and “low rates of savings may be part of the reason why.” Half of the respondents in Student Loan Hero’s survey have less than $1,000 saved, and 61 percent don’t have an emergency fund that could cover six months of living expenses. The reason, largely: student loans. New data shows that the average millennial with debt owes $36,000 and spends about 34 percent of their monthly income paying it off. “Unsurprisingly, having student loans reduces confidence levels, adds to money stress and makes it harder to accomplish other financial goals,” the survey says. While 57 percent of people without loans admit to having money worries, a whopping 75 percent of those with educational debt do. Borrowers also have lower savings rates: 43 percent of people with loans have less than $500 in savings compared with 37 percent of people who don’t owe money for school. “And, while a quarter of respondents without loan debt had $10,000 or more in savings, just 14 percent of student loan borrowers had put this much aside,” the survey says. With cumulative student loan debt in the U.S. over $1.5 trillion, “it’s undeniably burdensome to repay,” the survey says. Still, trying to get on top of your loans and any other debt you may have, like credit card debt, can help reduce stress and make it easier to achieve other financial priorities. If you’re struggling with paying down loans, saving for retirement, investing in the stock market or negotiating a higher salary, remember that “it helps to have a plan for what you want to accomplish and how to achieve it,” says Student Loan Hero. And while you may not accomplish everything overnight, “you can create a budget while setting clear financial goals” for the future.